Dilip Vengsarkar, who was the chairman of the BCCI selection committee, was 'removed' for picking Virat Kohli. Chennai: Dilip Vengsarkar was the chairman of the BCCI selection committee when Virat Kohli made his ODI debut against Sri Lanka in 2008. It was Vengsarkar who handpicked the Delhi batsman out of an Emerging players tour to Australia. However, the decision to select Kohli eventually resulted in Vengsarkar being removed, according to TV journalist Rajdeep Sardesai’s latest book - Democracy’s XI. 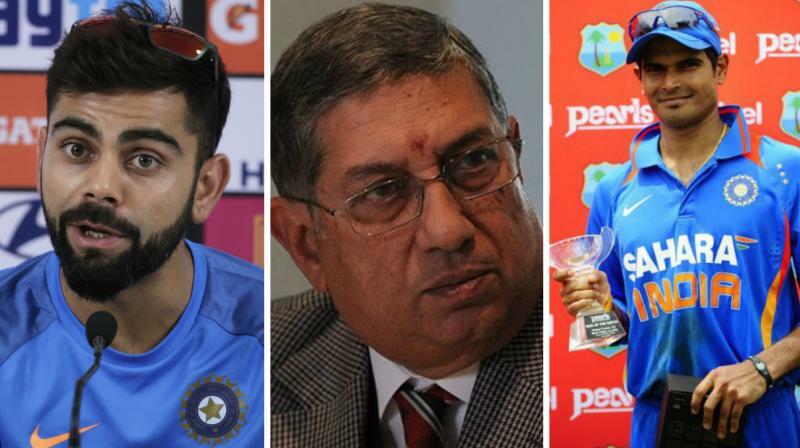 Some of the other selectors preferred Tamil Nadu’s S. Badrinath but Vengsarkar was insistent even as the then Board treasurer N. Srinivasan took the matter to the president Sharad Pawar. “When N. Srinivasan, then board treasurer and controller of Tamil Nadu cricket, found out I had dropped Badrinath for Virat, he was livid and went and complained to the board president Sharad Pawar. The next day I was removed as chairman of selectors but fortunately they couldn’t change my decision to pick Virat,” Vengsarkar was quoted as saying. Despite inspiring India to triumph in the U-19 World Cup in 2008, the transition to the senior team was a bit of a struggle for Kohli who found himself in and out of the XI scoring two fifties in his first 10 innings. To make matters worse, Kohli drew flake for his flamboyance. Kohli had become a victim of an “image trap”, according to another selector. “We were being fed stories of how Virat was binge-drinking in the 2009 IPL in South Africa and was more interested in his hairstyle and tattoos than his cricket,” a selector was quoted as saying in the book. Kohli, however, dismissed these report as “unfair rumours” and described the 2008-09 season a “depressing period”. Among those who supported Kohli was Yuvraj Singh, who had similarly been charismatic during at the start of his career. “I think I once told Virat quite seriously that ‘if you want to be a top class player, don’t copy me, make Sachin your inspiration. Be disciplined like him, not carefree like me’,” Yuvraj said. Kohli has come a long way from a chubby teenager to one of the fittest athletes. The change first began in 2012 after a tour to Australia.